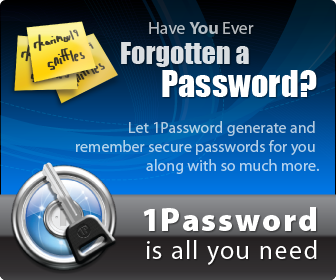 One Password – Have you ever forgotten a password? Two scenarios I frequently see in my business are clients who either can never remember their passwords (and often expect me to) or they use the same password for every site so it is easy for them to remember. Both of these scenarios are a BAD idea! I definitely do not recommend counting on me to remember all your passwords (sometimes I wish I was Superman). On the flip side, I strongly warn against using the exact same password (or even a slight variation of it) for all of your online accounts, especially accounts that contain financial information. It’s a good idea as well to change your passwords on online credit card and bank accounts more frequently to keep your accounts from being compromised. So if you need to use stronger, more varied passwords that you should change frequently, how are you supposed to keep track of all this? Those little post-its eventually get lost behind your desk (I know this because it used to happen to me too!). I have found an amazing solution to keeping track of those pesky passwords that my wife and I use for all of our business and personal online accounts: 1Password. 1Password is the program I recommend for keeping track of all of your usernames and passwords online. The program is compatible with both Mac and Windows (although it was originally developed for the Mac). It stores your passwords, and allows you to fill them in on a website with a simple click of a button. It has saved us so much time, not to mention the headache of forgetting a password, and having to go through the process of resetting a password or setting up a completely new account. The program is even available for the iPhone, iPad and Android! If you are interested in learning more about 1Password you can click here for more information, or feel free to call me at 640-6662 and I’m happy to install it for you and teach you how to use the program. Seriously, we love it here at the Mobile Computer Doctor!